Raja Ampat Archipelago has two primary checkpoints, which are Waisai and Sorong City. Both of them become the primary access for those who want to get around the islands, after all. Also, those cities own a series of tourist spots, which are worth a visit. In Sorong City, there is Raam Island. Even though tourists need to use a local boat to reach the island, it is quite rewarding. The locals also often call it Buaya Island. The accessibility is good, as the distance is about a half of kilometer from Sorong. There is a reason why people call Raam as Buaya Island. It is because of the shape of the island, which is similar to that of a crocodile (Buaya). Just because the name has “crocodile” in it, doesn’t mean the island is inhabited by such wild creatures. On the other hand, tourists can enjoy a beautiful island with its stunning beach. The cream-colored sand and crystal clear water may never fail to amaze visitors, as well. Not to mention the atmosphere is fresh and rejuvenating. In a nutshell, Raam Island is a perfect destination for a vacation retreat. The size of the island is about 5 hectares and it is quite tempting for an exploration. Mostly, tourists perform sightseeing and a small adventure in Raam Island. The fact is that visitors don’t need to pay any entry fee. It is free! The only issue is related to transportation, as the island is lacking facilities and accommodations. Thus, it requires a good stamina and time to all parts of the island. Due to the soft texture of the sand, people also love to do beach walking there. The most popular spot in Raam Island is definitely the beach, on which people can swim and enjoy beautiful seascape. The coast is also suitable for relaxing! Thanks to the presence of a formation of coconut trees. That means people can sit and relax under the trees. In the west part of the beach, some reefs are scattered in a natural way. Somehow, they become a perfect background for photography. When it comes to the east part of the island, tourists can witness Sorong City from afar. The next adventure is in the south part of Raam Island, which is suitable for snorkeling and diving. It is because many types or corals and fishes live there. As an alternative, people can do fishing in the sea. First, they need to find a boat to reach the fishing spot, though. Have no worries. Some villagers live nearby. Those people came from Buton and live in Raam Island as a fisherman. This explains why getting a boat is considered an easy task. As long as tourists know a bit of Indonesian Language, they can communicate with the locals well. 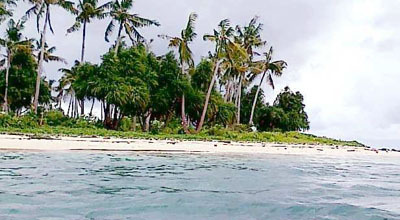 Raam Island is accessible from Sorong Port. It is good news for those living in Sorong City. What about outsiders? Well, the most recommended transportation is an airplane and the destination is Eduard Airport. From there, they can rent a boat to Raam. It takes about 20 minutes to get to the island.